How much asbestos is present in New Zealand? A hard and fast figure for how much asbestos is still present in buildings around the country is impossible to find, simply because its use was never accurately or directly recorded. However, a report released in 2015 on behalf of the Royal Society of New Zealand and the Office of the Prime Minister’s Chief Science Advisor detailed some of the numbers relating to asbestos’ use in New Zealand. For one, the peak year for the material’s import was 1974, when over 12,000 tonnes entered the country. Imports declined since that peak, the historical total amount of asbestos imported into New Zealand exceeds 200,000 tonnes. Much of this can still be found today in our buildings and machinery insulation. In comparison to other countries, New Zealand fell somewhere in the middle with respect to how much asbestos was used. Until the 1970s and ‘80s, New Zealand was behind other developed countries in use of the material. During that period, asbestos in New Zealand saw a surge in use that put our country above the United States and the United Kingdom in terms of per capita use. Our Australian neighbours, however, along with Canada, Denmark and Germany were still using far more. Is asbestos banned in New Zealand? You might have expected that as soon as the negative health effects asbestos caused were discovered, the material would be banned to limit its further use - this didn’t become the case until 2016. Before then, regulations were in place to make it difficult to bring all types of asbestos into the country and the aforementioned report from the Royal Society of New Zealand explains that a survey of building industry groups and other relevant parties found that asbestos-containing materials (ACMs) are not used often in modern construction - substitute materials have long been adopted. Despite the minuscule amount of asbestos being used, the material came into the public consciousness in a big way, according to researchers William Ivan Glass, Rob Armstrong, and Grace Chen, thanks to the Pike River mine explosion in 2010 and the Christchurch earthquakes in 2011. 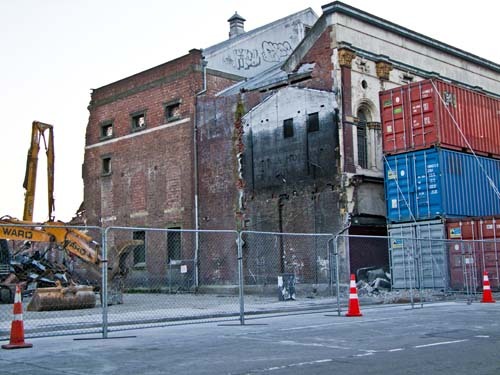 Buildings collapsing in the Christchurch earthquakes made the risk of airborne asbestos all the more apparent. As they explain in their paper, Banning Asbestos in New Zealand, the “urgent and widespread removal of demolished and damaged buildings, initially with little concern as to the nature of the demolition products whether concrete, brick, plaster, asbestos insulation or asbestos cement products, soon raised concerns among the public as convoys of trucks trundled past houses on their way to tip sites”. This fear of asbestos contamination inspired the Government to begin development of what would become the Health and Safety at Work (Asbestos) Regulations 2016, which banned the importation and exportation of all forms of asbestos and ACMs entirely. What is the health toll from asbestos in New Zealand? The reason asbestos and its presence is a problem is due to the health problems it causes. A detailed report from The Ministry of Business, Innovation and Employment (MBIE) covers the effects: for every one case of mesothelioma (a rare cancer of the lung caused by asbestos) there are between one and two cases of asbestosis and other lung cancers. In the years up to 2010, there were around 90 to 100 cases of mesothelioma every year. This is part, according to the report, of a ‘second epidemic’ of health problems occurring from initial exposure to the material during its heavy-use phase between the ‘50s and ‘70s. Despite the progress made with the full ban of asbestos-containing products in 2016, ACMs were installed in buildings all around the country for decades and decades. In practical terms, this means that - unfortunately - the risk from asbestos on Kiwi’s health isn’t just going to disappear. In fact, it will take time for the already present reserves of asbestos-containing materials to be either removed or encapsulated to a point where they’re no longer dangerous. The MBIE report says, however, that we can expect these negative effects to diminish gradually over time, as the complications from asbestos take long to develop; more recent regulations around the material mean fewer people today are exposed to it than ever before. With proper asbestos management, the risks of the material can be minimised as best as possible moving into the future. To learn more about having suspected asbestos in your home or place of business tested, get in contact with the expert team at Chemcare today.